The increased (and massively premature when you have an excitable four year old) visibility of chocolate Santas, holly adorned tubes of sweets and various other absurdly early Christmas related merchandise means one certainty… We’re in the final quarter of the year. Q4’s typically the busiest time of the year from a volume-of-bottles perspective – It can also be a volatile period from a value-of-bottles perspective. Q4’s first Scotch Whisky Auctions sale showed little of that volatility; values look to be holding steady with continued upwards bias for many bottles. Worthy of mention, fifteen of the top twenty most expensive bottles of the auction were from Karuizawa. Scotch did, however, punch a little above its weight from a value perspective with 26.6% of the value of the top 20 – slightly ahead of its 25% volume. With rarity in part driving the price of the most expensive bottle; one of just 68 bottles from Karuizawa’s cask 8333 managed a staggering £9,000. The most expensive bottle of Scotch at the auction is quite possibly one of the most hideously packaged ever. Awful/cronky packaging aside (irrespective of looks, try opening one of the bloody things! ), the Glenfiddich 38 year old ‘Ultimate’ hit an impressive £5,200. 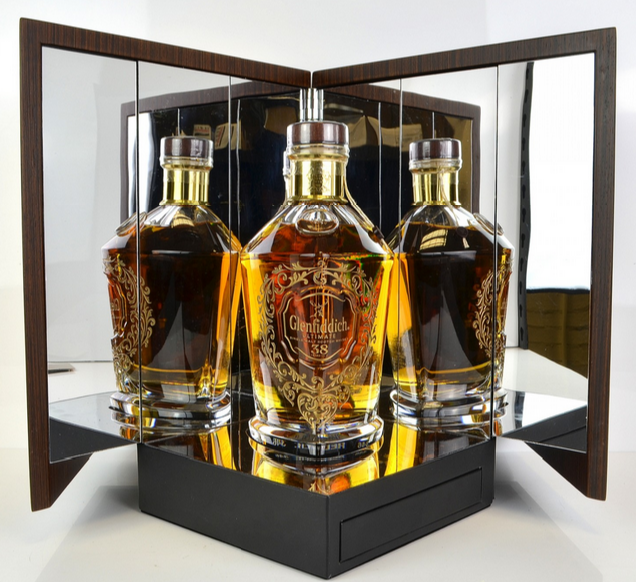 The fourth overall most expensive bottle and the second most expensive Scotch is the first record-breaker this week. 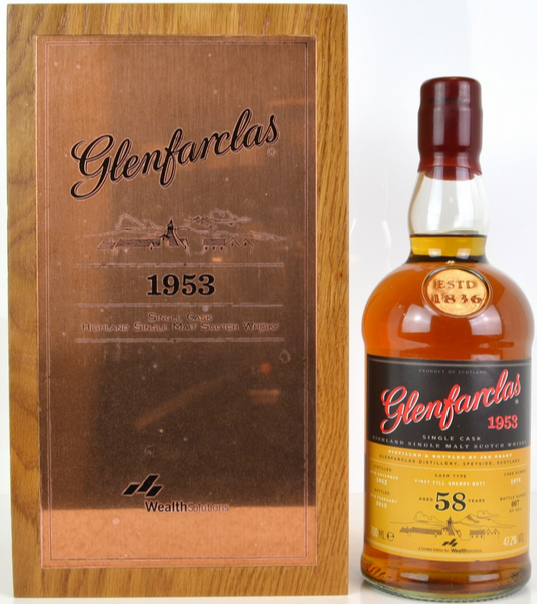 The 1953 58 year old Glenfarclas fetched £5,200 comfortably moving past its previous £4,450 record. 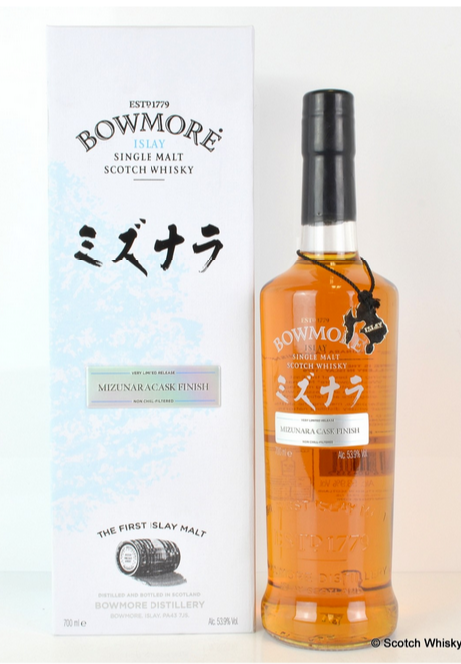 Much comment and the expected cries of outlandish pricing accompanied the recent launch of Bowmore’s NAS Mizunara Cask Finish. As the first bottle hit the open market and managed £1,200 (almost double its £650 retail price), it looks like demand comfortably exceeded the price tag. That said, we could see classic new release curve at play (first sales go high then settle as supply increases over time) so buyer-beware at these heady prices. With 2,000 bottles released, many will be drawn into the secondary market over time. Patience, again, could well be rewarded as open market supply naturally increases. This weeks final bottle from a currently producing distillery is the Rebus bottling from Highland Park. Values in general for Highland park remained static or slightly lower than recent highs. It was pleasing to see the Rebus bottle manage a record £2,600; more than three times its all-time low of £800. Dallas ‘Dhon’t’ put a lacklustre past performance well behind it and very much became ‘Dallas-don’t-mind-if-I-Dhu’ as new record prices were achieved for virtually every bottle sold. A brace of Signatory Cask Strength bottles on 1975 and 1979 vintages achieved £300 and £270 respectively (up from £210 and £160 respectively). A 1971 vintage Connoisseurs Choice edged up from its previous £150 to settle at £190. Again, from Signatory, a bottle of Glenlochy 1980 30 year old hit £250 up from a previous sale of £190. 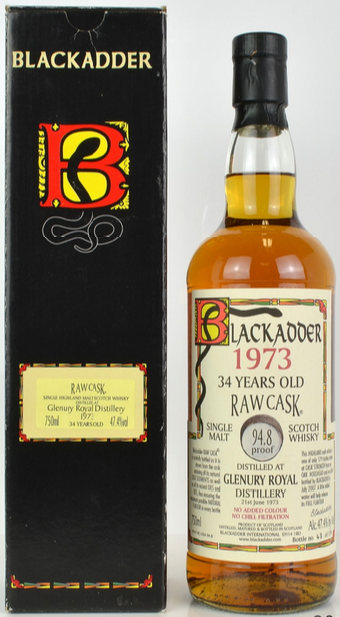 Glenury Royal also had a good auction with the OB’s at the top of their current trading range and a Blackadder bottled 1973 34 year old taking £340; up from just £165 last year. 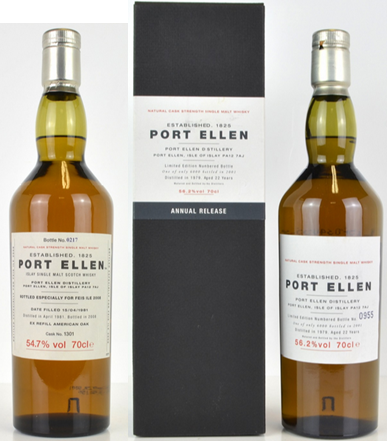 Port Ellen’s official bottles maintained their current up-trend with the first release making a record £2,200. The 2008 Feis Ile bottle hit a joint £3,400 high; an acceptable seven year increase from its original £100 selling price. That was one queue worth getting up at four o’clock in the morning for! With a little over two months left until Christmas, it would be hard to second guess the market at the year end. Last year showed us November and December can be tough months if supply goes through the roof… Right now though, things continue to look very positive. All images courtesy of Scotch Whisky Auctions.